Ground breaking experiments in EPJ B by D. Honecker and colleagues on an FeCr two-phase nanocrystalline alloy demonstrate the power of one-dimensional neutron-spin analysis in a small-angle neutron scattering (SANS) experiment. New experiments on the flow of solid He through a microscopic hole reveal a mechanism that triggers the geysers based on the breakdown of a plug located upstream of the source chamber. The vacuum expansion of solid helium through a micrometric orifice was suggested as a mean to inject excess vacancies into the solid bulk [R. Grisenti et al, J. Electr. Spectr. 129 (2003) 201]. 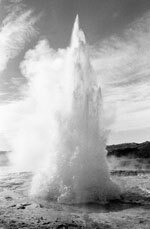 But while the He flow seems smooth, unexpected periodic bursts out of the orifice (geyser effect) are observed during these vacuum expansion experiments. 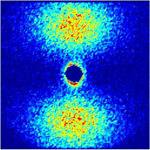 Only one liquid exhibits Bose-Einstein condensation in nature: Helium II, . At such temperatures, all other substances are solid. In these two papers, Vitaly Golovko demonstrates that Bose-Einstein condensation can also occur in the solid state. Moreover, it is shown that at 0 K, a condensate crystal is energetically preferable with respect to the same quantum crystal without condensate. Therefore, on lowering the temperature of the crystal there must somewhere happen Bose-Einstein condensation, as in liquid helium. This opens a huge field for experimental investigations of Bose-Einstein condensation and of its influence on properties of solids. Our understanding of elasticity, plasticity and failure in non-crystalline solids has greatly enhanced through atomic scale simulation. A new Colloquium paper In EPJ B reviews a variety of computational approaches that have been successful in elucidating the atomic scale phenomena that control the mechanics of amorphous solids. The constitutive theories that have been developed for describing mechanical response are briefly illustrated, as well as the prospects for testing the assumptions of these theories using simulation. The authors, M.L. Falk and C.E. Maloney, pose the most pressing open questions for substantiating these theoretical approaches, and ultimately for understanding and predicting the mechanical behaviour of amorphous solids. To read the full paper "Simulating the mechanical response of amorphous solids using atomistic methods" by M.L. Falk and C.E. Maloney, European Physical Journal B click here. Keiichiro Nasu reviews models of photo-induced structural phase transitions in relation to recent experimental results on unconventionally photoactive solids, where the relaxation of optical states results in macroscopic excited domains with new structural and electronic orders. Two key concepts, the hidden multi-stability of the ground state and proliferations of optically excited states are discussed. Taking the ionic to neutral phase transition in an organic charge-transfer crystal as example, the author documents the fundamental nature of photo-induced structural phase transitions. Further, Nasu recounts the details of the discovery of a new photo-induced phase of carbon, named "diaphite", located in between graphite and diamond. The mechanism of this photo-induced structural phase transition is discussed in terms of the proliferation of photo-generated inter-layer charge-transfer excitations in the visible regime. To read the full paper 'sp3 domain in graphite by visible light and photoinduced phase transitions' by K. Nasu, European Physical Journal B click here.